Hélio Gracie (October 1, 1913 – January 29, 2009) was a Brazilian martial artist who, together with his brother Carlos Gracie, founded the art of Gracie Jiu-Jitsu, known internationally as Brazilian Jiu-Jitsu (BJJ). Until his death, Hélio was the only living 10th degree master of the discipline and is widely considered as one of the first sports heroes in Brazilian history; he was named Black Belt Magazine's Man of the Year in 1997. He was the father of the world-renowned fighters Rickson Gracie, Royler Gracie, Royce Gracie, Relson Gracie and Ultimate Fighting Championship (UFC) founder Rorion Gracie. Gracie was also a 6th dan in judo. When Gracie was 16 years old, he found the opportunity to teach a Judo (at that time Judo was commonly referred to as Kano Jiu-Jitsu or simply Jiu-Jitsu) class, and this experience led him to develop Brazilian/Gracie Jiu-Jitsu.A director of the Bank of Brazil, Mario Brandt arrived for a private class at the original Gracie Academy in Rio de Janeiro as scheduled. The instructor, Carlos Gracie, was running late and was not present. Helio offered to begin the class with the man. When the tardy Carlos arrived offering his apologies, the student assured him it was no problem, and actually requested that he be allowed to continue learning with Helio Gracie instead. Carlos agreed to this and Helio Gracie became an instructor. Helio realized, however, that even though he knew the techniques theoretically, in fact, the moves were much harder to execute. Due to his smaller size, he realized many of the judo moves required brute strength which did not suit his small stature. Consequently, he began adapting Judo for his particular physical attributes, and through trial and error learned to maximize leverage, thus minimizing the force that needed to be exerted to execute a move. From these experiments, Gracie Jiu-Jitsu, later known as Brazilian Jiu-Jitsu, was created. Using these new techniques, smaller and weaker practitioners gained the capability to defend themselves and even defeat much larger opponents. Gracie was involved in an attack on gymnastics teacher Manoel Rufino dos Santos in 1935, at the age of 22. Hélio and three of his brothers went to Manoel's gym and attacked him after class in front of a crowd of cheering fans. Manoel suffered two fractures to his head, a broken arm and broken ribs. Gracie was prosecuted and sentenced to two and a half years in jail. An appeal was made to the Supreme Court by Gracie's lawyer Romero Neto and the sentence was upheld, as the court said "Today it was with Manoel Rufini dos Santos, Tomorrow it will be us." A couple of hours after that decision Brazilian President Getúlio Vargas pardoned Gracie, to the dismay of the Supreme Court. According to Gracie, one of his students had a brother who was an ambassador and was very close to Getúlio, and he intervened in favor of Gracie. Gracie and Getúlio subsequently met many times and Gracie eventually taught Getúlio's son Maneco. He soon realized that some of the techniques he had memorized from watching Carlos teach were not very easy for him to execute. He then started to adapt those moves to his frail body's abilities, improving the leverage in the execution of some of those techniques. He dared to break away from the traditional jiu-jitsu his brothers had learned and were teaching, and through trial and error, Gracie Jiu-Jitsu was born. Helio eventually fought 17 fights including matches against the world wrestling champion, Wladek Zbyszko and a qualifying fight against the #2 jiu-jitsu fighter in the world, Kato, who Helio choked unconscious in 6 minutes. This victory enabled him to enter the ring with the world champion, Masahiko Kimura, who outweighed Helio by over 80 pounds. Helio Gracie holds the record for the longest match in history for a battle against his former student, Waldemar Santana, which lasted an amazing 3 hours and 40 minutes! Gracie had 19 professional fights in his career. He began his fighting career when he submitted professional boxer Antonio Portugal in 30 seconds in 1932. Also in 1932 he fought American professional wrestler Fred Ebert for fourteen 10 minute rounds. The event was clamied to have been stopped because Brazilian law did not allow any public events to continue after 02:00 AM, but in an interview Hélio admitted that he was stopped to fight by the doctor due to the high fever caused by a swelling and he had to undergo an urgent operation next day. In 1934 Gracie fought Polish professional wrestler Wladek Zbyszko, who was billed as a former world champion, for three 10 minute rounds. Even though the wrestler was almost twice Helio's weight he could not defeat him and the match ended in a draw. Hélio then defeated Taro Miyake, a Japanese professional wrestler and judoka who had an extensive professional fighting record and worked for Ed "Strangler" Lewis in the U.S.
Hélio also fought several Japanese judoka under submission rules. In 1932 he fought Japanese judoka Namiki. Helio defeated the Japanese heavyweight judoka and sumo wrestler Masagoichi via armlock. The fight ended in a draw, but according to the Gracie's the bell rang just seconds before Namiki would have tapped out. Gracie had two fights with Japanese judoka Yasuichi Ono after Ono choked out Hélio's brother George Gracie in a match. Both fights ended in a draw. Gracie fought another Japanese judoka Kato twice. The first time was at Maracanã stadium and they went to a draw. Afterwards, Kato asked for a rematch. The rematch was held at Ibirapuera Stadium in São Paulo and Gracie won by front choke from the guard. "(moral) Victory for Helio Gracie." In 1955, Masahiko Kimura, at 38 years old, participated in a match in which he defeated Hélio in a submission judo/jiujitsu match held in Brazil. During the fight, Kimura threw Gracie repeatedly with ippon seoi nage (one point back carry throw), o soto gari (major outer reap) (Kimura's signature throw). He threw Gracie 3 times with o soto gari o uchi gari (major inner reap), uchi mata (inner thigh throw) and harai goshi (sweeping hip). Kimura reportedly threw Gracie repeatedly in an unsuccessful effort to knock him unconscious; Kimura later claimed that the reason was excessive softness of the mat. Kimura also inflicted painful, suffocating grappling techniques on Gracie such as kuzure-kamishiho-gatame (modified upper four corner hold), kesa gatame (scarf hold) and sankaku jime (triangle choke). However Kimura was not able to make Gracie submit even though he had claimed in the press that he would finish the fight with the first grip. He also claimed that if Gracie can survive 3 minutes, he should consider himself a winner; the fight lasted 13 minutes. Finally, thirteen minutes into the bout, Kimura positioned himself to apply a reverse ude garami (arm entanglement, a shoulderlock). Gracie refused to submit despite his arm being broken. At this point, Carlos Gracie, Gracie's older brother, interrupted the match because he knew that his brother would not submit. In 1994, Gracie admitted in an interview that he had in fact been choked unconscious earlier in the match, but had regained consciousness when Kimura released the choke. As a tribute to Kimura's victory, the reverse ude garami technique was named as the Kimura lock, or simply the Kimura, in Brazilian Jiu-Jitsu. "20,000 people came to see the bout including President of Brazil. Helio was 180 cm and 80 kg. When I entered the stadium, I found a coffin. I asked what it was. I was told, "This is for Kimura. Helio brought this in." It was so funny that I almost burst into laughter. As I approached the ring, raw eggs were thrown at me. The gong rang. Helio grabbed me in both lapels, and attacked me with O-soto-gari and Ko-uchi-gari. But they did not move me at all. Now it's my turn. I blew him away up in the air by O-uchi-gari, Harai-goshi, Uchimata, Ippon-seoi-nage. At about 10 minute mark, I threw him by O-soto-gari. I intended to cause a concussion. But since the mat was so soft that it did not have much impact on him. While continuing to throw him, I was thinking of a finishing method. I threw him by O-soto-gari again. As soon as Helio fell, I pinned him by Kuzure-kami-shiho-gatame. I held still for 2 or 3 minutes, and then tried to smother him by belly. Helio shook his head trying to breathe. He could not take it any longer, and tried to push up my body extending his left arm. That moment, I grabbed his left wrist with my right hand, and twisted up his arm. I applied Ude-garami. I thought he would surrender immediately. But Helio would not tap the mat. I had no choice but keep on twisting the arm. The stadium became quiet. The bone of his arm was coming close to the breaking point. Finally, the sound of bone breaking echoed throughout the stadium. Helio still did not surrender. His left arm was already powerless. Under this rule, I had no choice but twist the arm again. There was plenty of time left. I twisted the left arm again. Another bone was broken. Helio still did not tap. When I tried to twist the arm once more, a white towel was thrown in. I won by TKO. My hand was raised high. Japanese Brazilians rushed into the ring and tossed me up in the air. On the other hand, Helio let his left arm hang and looked very sad withstanding the pain." 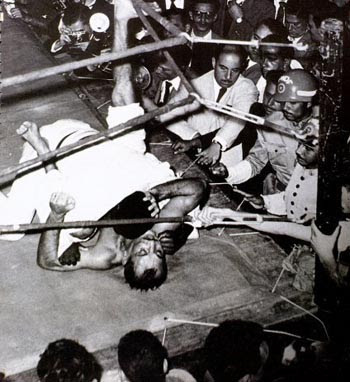 In May 1955 at the YMCA in Rio de Janeiro, Gracie participated in a 3 hour 42 minute fight against his former student Valdemar Santana, with Gracie losing by technical knockout due to exhaustion. This fight is the longest uninterrupted MMA fight in history. Hélio also challenged heavyweight boxing world champions Primo Carnera, Ezzard Charles and Joe Louis to matches to compare styles. They all declined. Throughout his career, Hélio defeated fighters from several different styles in order to prove that a small person can neutralize superior strength and athleticism through the knowledge of Jiu-Jitsu. However, his most heroic act was carried out outside of the ring. When traveling southbound towards Rio de Janeiro onboard a big cruise ship called Itanajé, Hélio Gracie and his brother Carlos couldn't see shore. As they enjoyed the sight of the big waves crashing against the side of the ship, they sensed a storm approaching on that gloomy afternoon in mid November 1946. Suddenly, the screams of "Man overboard!" brought panic throughout the ship. A passenger had jumped overboard in attempt to commit suicide. A boat with five sailors was immediately put into the water to rescue the drowning man. The big waves made it difficult for the sailors to reach the man who was approximately 700 feet away. When the boat finally reached him, they tried pulling the drowning man onboard. Again the big waves would get in their way by lifting the boat up and bringing the man down, preventing the rescue from happening. After trying to save the man for 20 dramatic minutes, the captain ordered them back, giving up on the rescue. The man was left to die. Watching all of this from the ship, Hélio asked his brother "Why didn't they jump in the water and pull him into the boat?" From behind a sailor warned: "This is Abrolhos". Without getting an explanation and without realizing that what he meant was that the Abrolhos area holds the highest concentration of sharks in the Atlantic Ocean, Hélio asked his brother if he didn’t feel like saving the man. Carlos replied: "Yes, but I don't think I can get there". Without hesitation Hélio said: "I think I can" and immediately stripped to his shorts. As he swam towards the man, he ordered the sailors in the rescue boat to turn around. From the water Hélio was able to get a good enough grip on the dying man, and with the help of the sailors, he put him into the boat, saving the man's life. Besides the big celebration on the ship, he was awarded a Medal of Honor for his act of bravery." Helio Gracie's son Rorion brought Gracie Jiu-Jitsu to the United States and later founded the UFC. Royce Gracie, Rorion's younger brother, went on to become the first UFC champion in the organization's history; Helio coached Royce from outside the cage at UFC 1 and UFC 2. Gracie died on the morning of January 29, 2009 in his sleep in Itaipava, Rio de Janeiro. The cause of death, reported by the family, was natural causes. His last words were: "I created a flag from the sport’s dignity. I oversee the name of my family with affection, steady nerves and blood".Gracie was able to utilize the same Jiu-Jitsu techniques which he helped to develop until his death at the age of 95. An example of courage and determination, Hélio became an international hero. A dedicated family man who exemplified a healthy life-style he was the epitome of bravery, discipline, willpower, and an inspiration to people everywhere. A modern-day legend, Hélio Gracie gained international acclaim for his dedication to the dissemination of the art and is recognized as the creator of Gracie/Brazilian Jiu-Jitsu. “I created a flag from the sports dignity. I oversee the name of my family with affection and nerves of blood."